In opening and closing the Genesys CX18 event this week, CEO Paul Segre stressed the importance of innovating -- for Genesys itself, its customers, and, well, every other business on the planet. The conference theme, "Connect, Engage, Innovate," is meant to convey that each of these elements are intertwined, and that connecting and engaging with customers is an essential ingredient for innovation. For Genesys, Segre said, innovation comes in two different ways: organically, through research and development, with $250 million invested every year, and inorganically, through acquisition -- 16 in the last six years. In its R&D, Genesys continues to bet big on artificial intelligence (AI), infusing its product portfolio with intelligence in a "blended" approach via virtual assistant Kate and launching new machine learning (ML)-driven solutions like Predictive Routing (read related No Jitter post). Additionally, Genesys continues to invest in the enhanced augmented reality/virtual reality (AR/VR) solutions that date back to concepts developed at Interactive Intelligence (ININ), which it acquired in December 2016. The AR/VR solutions -- you guessed it! -- also incorporate AI in the personified form of Kate, as Genesys AR/VR SME Simon Wright showed in a couple of on-stage demos. The first demo focused on tourism use cases where a cruise line, for example, could provide customers with a way to explore a ship prior to purchasing their vacation trips. In the demo, the user was even able to venture out to the destination cities and click to roam down streets and navigate to local restaurants or beaches, for example, to get a fuller picture of what the trip experience would be like. While the user is exploring, an embodied Kate is present to enhance the experience by making herself available for questions and offering up details as relevant. And at the end of the VR session, Kate gives the user a call to action, directing him to click an embedded button to chat with a booking agent or offering up a Web link detailing next steps. 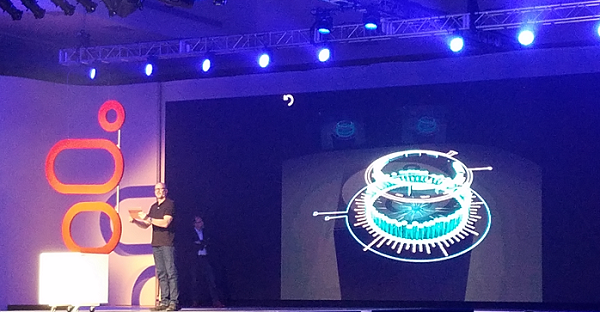 In the second demo, Genesys demonstrated a "3-D heightened [living data experience,]" as described by Genesys CMO Merijn te Booij. The demo featured millions of data points in a sphere shape to show how AR/VR technology could allow dynamic visualization of a data ecosystem. "Mixed realities will radically change the way we think about CX," said te Booij. He also echoed colleagues' comments that Genesys feels it's important to be transparent about how much AI is going to impact Genesys strategy moving forward. Genesys also announced this week that it has adopted a microservices architecture (which was ININ's approach as well) in order to "homogenize" its technology across its three core platforms -- PureCloud, PureConnect, and PureEngage. With this model, Genesys only has to build features and capabilities once, as microservices, and customers can use them regardless of which system they're running, Peter Graf, chief product officer, said. A microservices architecture bridges the on-premises and cloud worlds by eliminating the issue of having certain capabilities only available to cloud customers and others only available to premises-based customers, he added. Additionally, Genesys is offering more open APIs for developers who want to expand on its technology, Graf said. As part of Genesys's summer release (Q2/Q3), PureCloud gets GDPR compliance in time for the May 23 deadline, Authenticated Chat, Amazon Lex integration support, and improved agent scheduling capabilities for workforce engagement management (WEM). As part of Genesys's winter release (Q4/Q1 2019), PureCloud will get Predictive Routing, Predictive Engagement, cognitive IVR, deep learning-based forecasting for WEM, and the Bring-Your-Own-Carrier option the company announced in February. For the summer release, PureConnect gets GDPR compliance (also in time for the deadline), widgets and Web chat capabilities, chatbots for self-service, forecasting and scheduling engine for WEM, and new data analytics. For the winter release, PureConnect will gain Predictive Routing, Altocloud Proactive Engagement, cognitive IVR, early adopter program Agent Assist for WEM, and FedRAMP certification. With the summer release, PureEngage gains CX Contact for Outbound, Apple Business Chat, Predictive Engagement, cognitive IVR, forecasting service for WEM, and Salesforce Lightning support for outbound voice. With the winter release, PureEngage will gain Predictive Routing in the cloud, Altocloud Holistic Customer Journey, Google click to message, Adobe Marketing campaign integration, chatbots and cognitive IVR on PureEngage Cloud, agent assist for WEM, and WebRTC. The company's product strategy has already served it well, evidenced in the nearly 700 new businesses it's signed on in the past five quarters, Genesys president Tom Eggemeier said in a No Jitter briefing. While on-premises deployments continues to represent the majority of Genesys business, more than half of the 700 new customers (roughly 400), including notable brands such as Coca-Cola, selected a cloud model. As such, cloud now represents roughly one-quarter of Genesys business. Further, about half of these PureCloud wins are from businesses outside of North America, and 14% are in retail -- a traditionally underrepresented vertical for Genesys, Eggemeier said. Of the total 700 new logos, 75% migrated off legacy systems from Avaya and Cisco, Genesys said, although it did not share further detail about average deployment size or how many seats these 700 logos represent.